WOW! This is my 300th blog post! I never thought I would make it this far. To celebrate, let me show you another recent project watch. The first Automatics that Hamilton introduced were called "Automatic" with a K-designation. Within a few years other model lines were introduced like the Rotomatic, Astromatic, and Kinematic. A more prominent model line was the Accumatic lineup- in fact, there are 66 Accumatic models - more models than in any other automatic line. 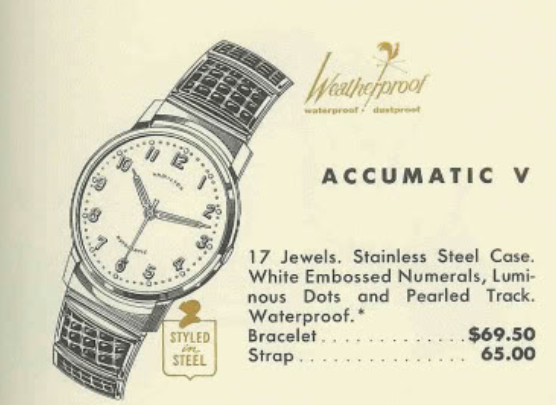 One of the early Accumatic was the Accumatic V. It was introduced in 1958 and made for two years. 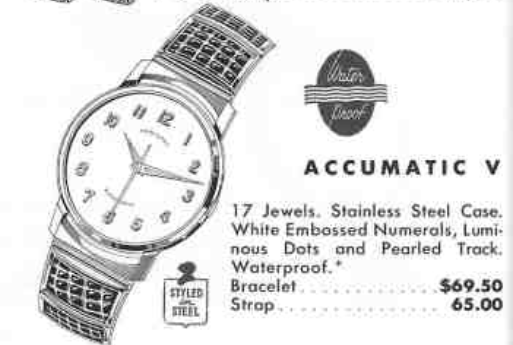 The Accumatic V came in a stainless steel case with a white embossed dial with numerals. The hour markers and the hands are lumed to glow in the dark. The 1958 catalog shows the Accumatic V with luminous dauphine-style hands but the 1959 catalog shows a different luminous style hand. Under the dial is a Swiss-made Hamilton 672 movement with 17 jewels. It was made by ETA and based on the ETA 1256 - a common automatic movement from the period that you will find in a variety of makers. A recently picked up an Accumatic V project watch and it came with it's original bracelet - which is always fun to find. It's pretty well worn and ready for some tender loving care. Observation of the case back shows that the stainless steel back pops off using a lip between the 6:00 lugs. The 672 is a nice movement and was also used in the Hamilton Illinois Automatics from earlier in the 1950's. All the parts are disassembled, cleaned and dried before being reassembled with fresh lubrication. Without the oscillating weight (rotor) installed, the movement is similar to ETA mechanical grades and will run just fine, as shown below. Putting the movement on the timer shows that it's running 102 seconds fast per day. A little tweaking to the regulator will slow it down. It won't take much to get it more in line. Here you can see me slowing it down as the slope of the two lines approaches horizontal. Perfectly horizontal means an exact beat rate of 18000 beats per hour. With the watch now keeping excellent time, I'll put the rotor back on. As the weight swings around, the watch will be wound. Once it's fully wound, the mainspring will slip a little, and release some of the tension. So an automatic can wind and wind and wind without damaging anything. I took the time to relume the dial and hands before reinstalling them on the movement. Then everything goes back into the case, protected by a fresh crystal. This Accumatic V is ready for 50 more years of wrist time. I continue to enjoy reading about your endeavors. It is exciting to see all of the interesting pieces you bring back to life and learning tips and tricks of the trade. Looking forward to 300 more! Maybe... you're always welcome to email me with a ridiculously high offer - ha ha! Sure looks like it to me too. Dan can you do a basic service on my '59 accumatic V?